Because the first call is usually not the first contact, it is crucial that contact centres have a better understanding of a customers’ online behaviour. Ovum research indicates a gap between customers’ needs and the support solutions delivered. This increases the number of interactions required before a customer actually resolves their issue. To adapt to the changing behaviour of customers, contact centres need to optimize the channel through which the majority of users look for help first – online. Ovum also suggests that contact centres should rethink the tools they are using along with the prioritization of the different support channels. By providing adequate online support, companies could divert a large amount of calls away from their contact centers and free up time for agents. When customers seek support, they choose the channel that requires the least amount of time and effort to find answers to their questions. According toForrester, US online adults prefer web and mobile self-service over speaking with an agent over the phone. Globally, more than 60% of customers (in North America, Europe, Australia & New Zealand) call the contact center after searching for information online. According to Ovum, only 9% of call center managers believe that their customers use the web frequently before calling for support. However, more often than not first call resolution does not equal first contact resolution. On average it takes two interactions before customers resolve their support issues,Ovum remarks. Based on insights from industry experts such as Ovum and Forrester as well as our own experience, we gathered practical suggestions that could be considered when contact centers aim to shorten resolution times. About 83% of contact centers (the Forrester research in North America, Europe, Australia & New Zealand) offer website self-service/FAQs as a support channel to their customers. However, more than 60% of their customers still call the call center after searching for an answer online. This data suggests that customers are unable to find solutions to their issues during this interaction. There could be various reasons for that, ranging from difficult-to-navigate webpages to complicated, not visual FAQs. Improving your self-service/FAQ pages could have a large impact on first contact resolution rate. In our experience, users respond well to straightforward, step-by-step tutorials, which are combined with supporting visuals. As the smartphone is often the device of choice of your users, it is imperative that your self-service is designed mobile-first. 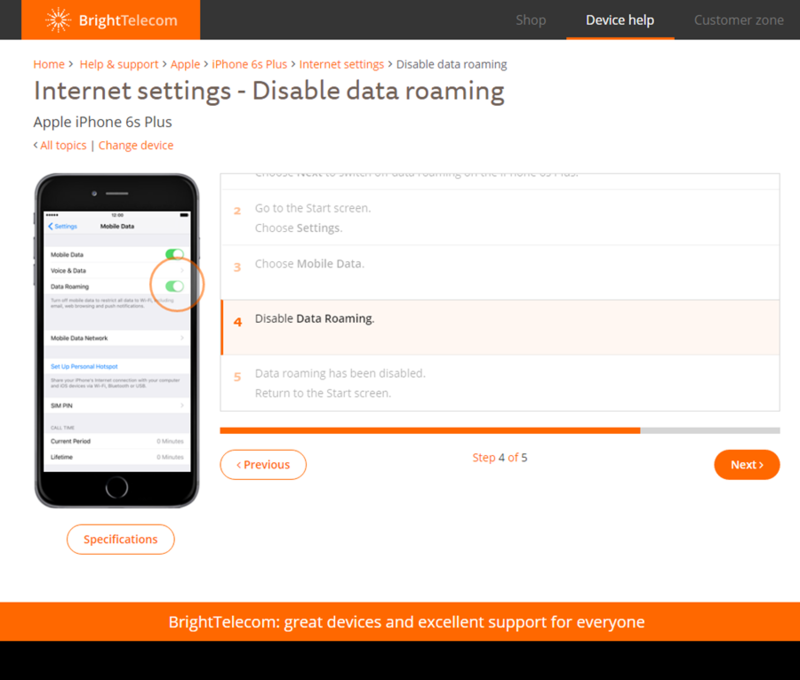 This is an example of a QelpCare interactive tutorial for iPhone 6 Plus, showing customers how to disable roaming. By providing easy visual instructions, the application delivers 85% first contact resolution rate. Ovum encourages contact centers to review their existing tools. All too often, contact center knowledge bases lack consistency. The instructions customers find on the help webpages are sometimes different to the call center knowledge bases. The social customer service agents give different responses to similar questions. The length of time spent browsing through community forums leaves users more confused than when they started. When you list these challenges, it is clear that contact centers need the same knowledge content as the online channels in order to deliver consistent answers. Adopting an integrated knowledge base will help contact centers to provide consistent answers throughout all touchpoints of the customer’s journey. Although the number of customers using non-traditional support channels (Web, SMS, Social Media, Live Chat, etc.) has increased significantly, according to Ovum’s research, many contact centers have not adjusted. The report clearly shows that the time taken to reach an agent is still the main complaint of customers. According to Forrester,”73% of consumers reported that valuing their time is the most important thing a company can do to provide them with good service.” Customers are time-poor and do not want to spend it on the waiting line. That is why prioritizing channels such as live chat and social media should be considered. By doing so, agents could handle more queries at once and reduce the waiting time. To improve first contact resolution and free up time for their agents, contact centers need to adapt to the changing behavior of customers. As many customers start their support journey online, providing adequate online self-service is important. To ensure better access to agents and faster response times, investing in solutions such as live chat could make sense for many contact centers. All in all, adopting an integrated knowledge base which delivers consistent answers across all support channels could reduce the complexity of support and deliver faster problem resolution.